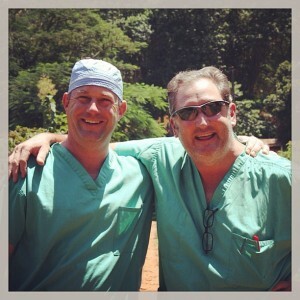 Dr. Russ Woda and Dr. David Caldwell are fellow anesthesiologists at Riverside Hospital in Columbus, Ohio. Dr. Woda is one of the founders of Three Strands and encouraged his colleague to join him on a recent trip to Africa. In order to see the dream develop, the Taylors, along with Russ and Melinda Woda, founded Three Strands. The name Three Strands comes from Ecclesiastes 4:12, which talks about how a chord of three strands isn’t easily broken. The Wodas are both Grace College graduates. She’s a registered nurse. He’s an anesthesiologist at Riverside Hospital in Columbus, Ohio. “The Wodas have been engaged in CAR for 16 plus years with several short term ministry trips under their belts,” adds Mike. Taylor said that Three Strands has a mission to “provide competent, compassionate and Christ focused” health care to those in the CAR. The Grace Brethren have had a ministry presence in Bangui, CAR, for nearly 100 years. As a part of the ministry in Bangui, the Taylors have led numerous medical teams on short-term visits to the area. Teams focus on “primary care, surgical care, dental care, and nutritional support,” treating patients, as well as praying for them. However, Taylor said that about four years ago, he realized the need to have a ministry with lasting potential, rather than teams that are always coming and going. Just as in every developing country, the needs of Central African patients are always mounting. Three Strands’ goal for the new facility is that it will become “a world-class surgical facility that becomes a beacon of hope for suffering people in the Central African region.” Taylor hopes to have this facility launched and fully operational by 2015. For more information, see three-strands.org or “like” their Facebook page. Sarah Kraus interned with the Brethren Missionary Herald Company during the fall semester of 2012. A graduating senior at Grace College in Winona Lake, Ind., she is from Eldersburg, Md.